New! 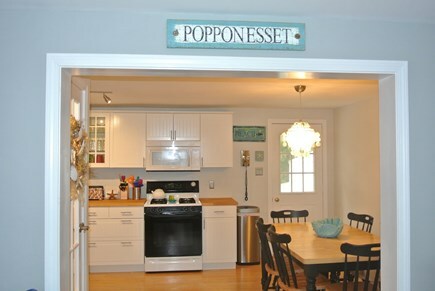 Charming Cottage in Popponesset. Walk to Private Beach! 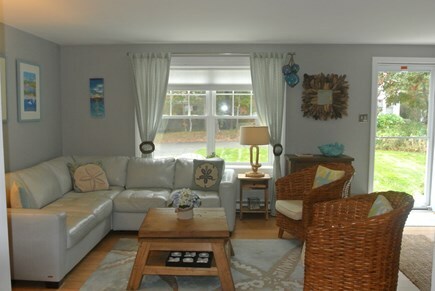 Come relax and enjoy our recently updated and tastefully furnished beach cottage in family friendly Popponesset ... the perfect spot for your family summer vacation, wedding, golf, or weekend getaway. Let our home become your Cape home away from home. Everything you need will be here waiting you! 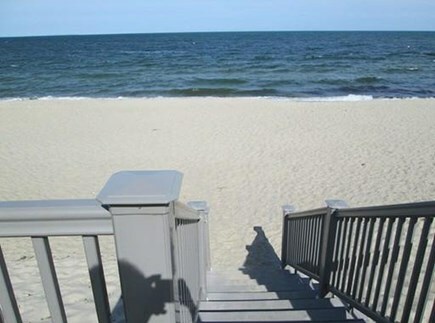 Walk to our private community beach (approx. 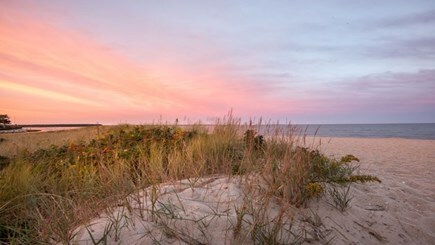 300-400 yards away), and enjoy the warm ocean water of the Nantucket Sound, kayak or paddle board in Popponesset Bay, or search for critters along the popular Spit. 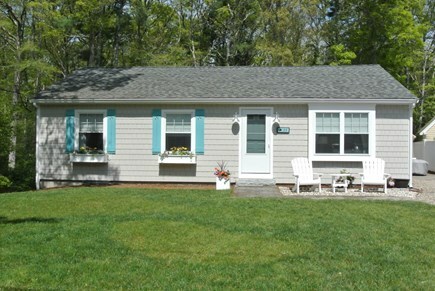 Our cottage provides you with 3 bedrooms, 2 full bathrooms, and an awesome outdoor shower! 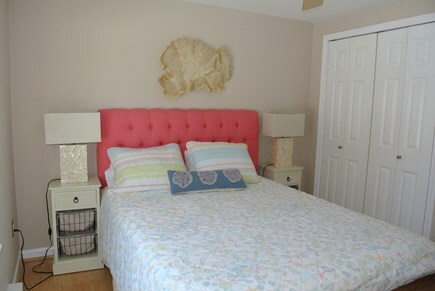 The master bedroom has a queen bed, en suite bathroom with shower, and LCD TV & DVD player. The second bedroom (with a queen bed) shares a full bathroom with a double sink and tub/shower combo with the third ''childrens'' bedroom (with twin bunk bed and trundle). 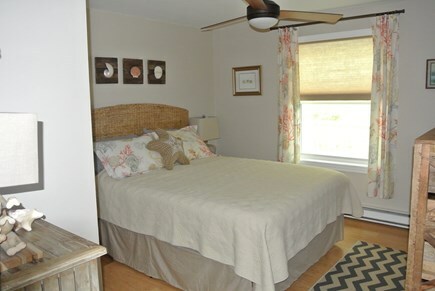 Ceiling fans are located in each of the bedrooms and keep the rooms cool and comfortable at night. For those hot summer days, there is a window AC located in the main living area. 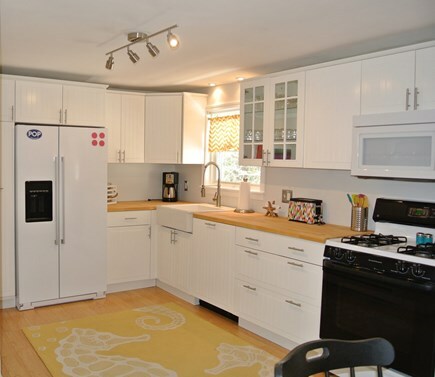 The fully applianced kitchen has everything you could possibly need and more (including a lobster pot!) and an eat-in dining area that seats six. 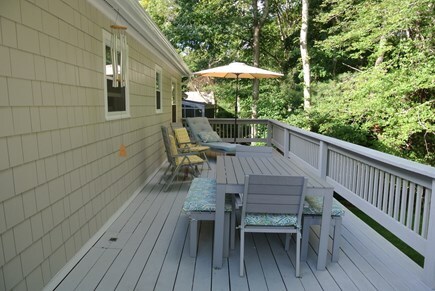 Outdoor space offers you a patio area with lounge furniture in addition to a spacious deck with a dining table and gas grill overlooking a private, wooded back yard. We even supply a variety of yard games for your use and enjoyment. 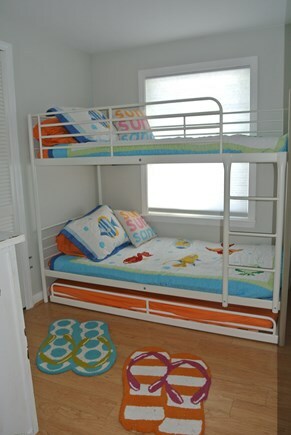 A few of the extra amenities provided are bed linens and bath towels (you only need to bring your own beach towels), all of your beach necessities - umbrella, chairs, beach cart, wagon and sand toys in addition to all basic household supplies (TP, paper towels, laundry & dish detergent). No extra packing or shopping needed! Children can walk or bike to the ball field, playground or Dean's Pond where they can learn to fish or feed the ducks. Our Community Center is one short block away and offers daily morning and evening activities for all ages during the summer season. Take a short drive, bike ride or walk to the Popponesset Marketplace featuring a general store, ice cream shop, candy store, pizza parlor, miniature golf, children's toy store, specialty shops and boutiques. The award winning lobster rolls at the Raw Bar are a must! Live entertainment is provided Thursday-Sunday evenings each week during the summer season. 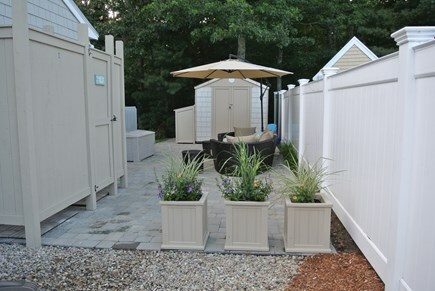 Enjoy a beverage at the Gazebo while the kids dance to the music or waterfront dining at the Popponesset Inn. Still looking for more to do? 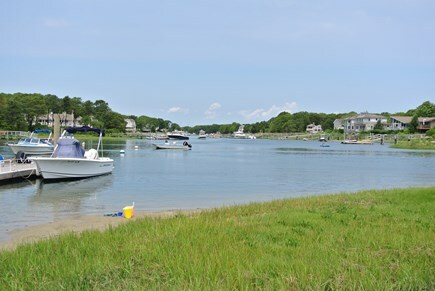 Travel 3 miles by car to Mashpee Commons which features 90+ shops, a movie theater, bowling alley, concerts, family entertainment and numerous restaurants or visit the nearby Cape Cod Children's Museum. 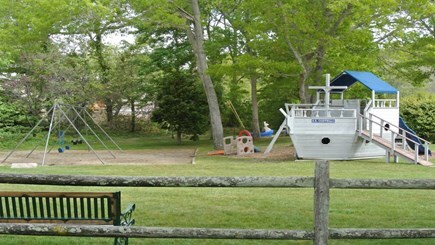 Take a ferry from nearby Falmouth or Hyannis to Martha's Vineyard or Nantucket or explore the Aquarium, Oceanographic Institute and waterfront restaurants in Woods Hole. So much to do ... so little time! Why not stay for two weeks?! Additional availability info: Available Daily w/ 2 Night Minimum during Off Season. Please inquire. This is a Saturday to Saturday vacation rental. Long-Term Rental (1 month or more): Long term rental considered from October to May for $1,500-$2,000 a month, depending on party size and length of stay. Utilities not included. Additional pricing info: Refundable Security Deposit $300; Cleaning & Linens Fee $150 weekly/$100 weekend, State and local taxes of 12.45% will apply. 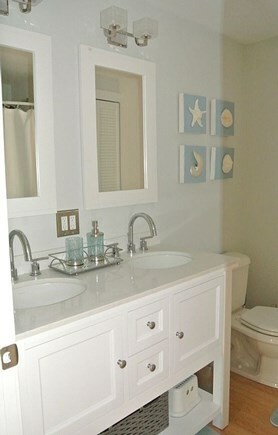 Cottage is single floor living with a small front entrance step. Ramp available. Vacationed at above property for the week of June 9th. Home was clean and kitchen was well stocked with everything needed for cooking. Especially liked that there were paper plates available for use for a quick sandwich lunch. 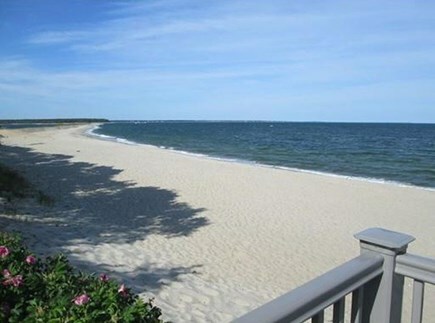 Home is within walking distance to the beach and a great location for day trips into Hyannis and the ferry to Martha’s Vineyard. Lots of great restaurants nearby also. Would definitely recommend this home. Owner very friendly and accessible if needed. Had a great stay. Perfect Stay for our Wedding Weekend! The Poppy House was the perfect place for us to stay for our wedding weekend in April! My mom, now husband and I stayed for the Thursday night before our Saturday wedding, my mom and I Friday night and my husband and I Saturday night and Sunday night, and we could not have asked for a more perfect place. Erin’s perfectly decorated, welcoming Cape home is exquisite. She was so accommodating knowing that we were getting married, and allowed us the use of her basement to complete our flower arrangements, and all of the storage of the wedding buckets in the side kids bedroom. The house had everything we needed and much more! We listened to the music from the speakers in the living room while preparing the wedding favors, and sat on the comfortable couches the day after to open our wedding cards and relive the wonderful day we had just had. Everything in the house is absolutely perfect -- beautifully picturesque yet comfortable! For anyone looking for an off-season rental on Cape Cod for a little weekend away, or for anytime, I would recommend Erin’s home for sure!